First, a good one from the second Summer 2007 issue of the online super zine, Simply Haiku, by Robert D. Wilson. . According to the author, his newest book is volume one of a proposed multivolume saijiki that will cover the five seasons. Blyth, of course, wrote a four volume series dealing with the four seasons, but Gill's book goes into much more detail, covering deeper ground. Written in accessible language (no scholar-speak for this author), we are taken by the hand into Gill's world, like Alice following the hare into a wonderland that's more than meets the eye. Haiku is given its proper due. We are exposed to the incredible, often delicate depth of beauty and introspection of a genre that is grossly misunderstood by many English language school teachers and by well-meaning poets as well. As is clearly seen here in Gill's commentary, an Occidental can easily misinterpret a Japanese haiku, being unfamiliar with the language and culture. Add to this a lack of familiarity with archaic Japanese, which at times is not always in sync with its contemporary counterpart, and the chance for misinterpretation is doubled. 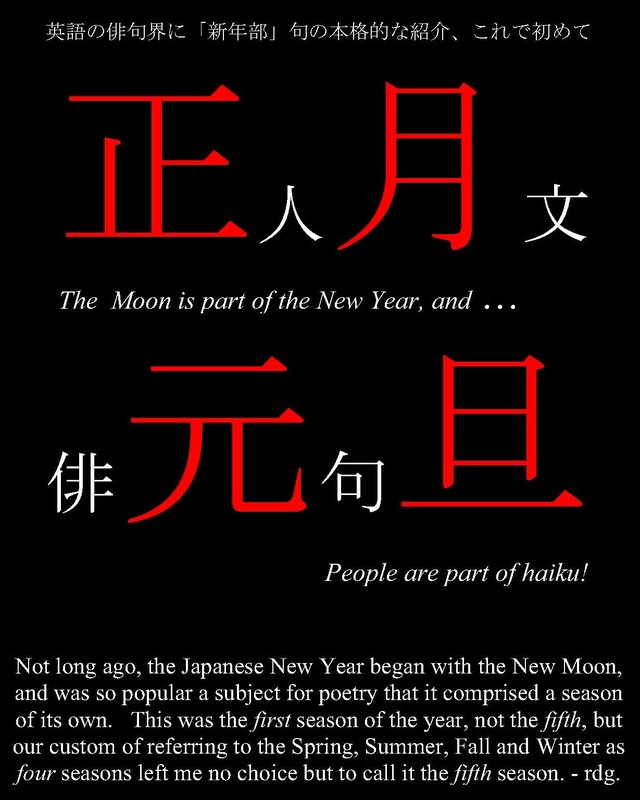 Translating a haiku is not a simple matter of taking out a Japanese language dictionary, looking up the meaning for each word and, voilá, the English language translation of the poem emerges. It's an intricate art-form. There are literally hundreds of haiku in Gill's book [au. : actually about 2,000], The Fifth Season, and with a few exceptions, all are translated by the author coupled with commentary and alternate translations. This is Gill's signature style, and fortunately for the reader, his exposition and commentary are accessible to the lay public. words . . . "
The Fifth Season is Gill's finest book to date and I anxiously look forward to the other volumes promised in this series. Now a bad one. It was published in Lynx, a free-spirited on-line journal for linking poets of many genre October 2007, which has published glowing reviews of my other books by a different reviewer, and is by Jeffrey Woodward, a poet living in Canada. Robin D. Gill, in this initial contribution to his encyclopedic In Praise of Olde Haiku (IPOOH), announces his ambitious design for a 10 volume series, with two titles devoted to each haikai season (New Year, spring, summer, autumn and winter) and twenty individual topics covered in each volume, for a total of 200 topics overall. The 468 pages of The 5th Season, therefore, represent only half of the projected material on the New Year season alone. Gill, however, is quick to disavow any notion that he is compiling a saijiki or haiku almanac: “IPOOH is too limited to be called a proper saijiki, because only 200 themes (40 per season) would be insufficient to fully flesh-out the year even if they were chosen for their importance, which they are not (p.19).” [Author: Ahem! To say my book is not a “proper saijiki” is not to say it is not a saijiki! Is the critic dizzy from riding the Chinese “white-horse” (“Is a white horse a horse”)?] Gill proceeds to explain that the limitation is self-imposed and that he aimed at an in-depth survey with many haiku on a few chosen themes as against a cursory overview with few haiku on many themes. The compass of a book review will not allow a through survey or even a broad overview of Gill’s stated design for the entire project. What can be done, however, is to comment upon one chapter -- one, that is to say, of the book’s twenty themes. I choose, randomly, Chapter 13, “First Dream,” and will focus only on its opening illustrations and Gill’s commentary (pp. 291-298). Gill’s format mirrors that in Blyth’s Haiku: commentary as well as occasional editorializing, some translated haiku, further comments, and yet more haiku. If Gill’s general model is Blyth, Gill shares something of Blyth’s maverick style and iconoclastic manner: his scholarship and broad reading as well as a cozy self-assuredness and quirky impatience with opinions that contradict his own. Author: I like Blyth but Blyth is hardly my model. He chose conventionally good haiku and interpreted them in terms of Zen. I choose haiku, many of which he would have avoided like the plague, to develop themes and interpret them from multiple perspectives. I do try to follow Blyth, remembering that it is better to be wrong than to bore the reader, but, if anything, I still qualify things too much. Because I often introduce many possible interpretations, only giving an opinion as to my favorite and readily admit to being unsure, I have been criticized with justification for not exercising enough authority more than once, so I wish this curmudgeon would explain just what he means by my “cozy self-assuredness” and “quirky impatience with opinions that contradict his own”! Until I see examples of what he means, I cannot help but suspect he conflates fact and opinion. His use of the expression “seventeen syllable verse” in the course of his review tells me that he probably resents my stating the fact that the Japanese haiku is the equivalent of English poetry7-8 beats in length whereas most 17 syllable English poems are closer to 10-13 beats and far too long by comparison. Blyth came to realize this around 1960 and, more recently Higginson and others have actually timed them. Still, there are those who pretend that we have the choice between 5-7-5 English syllables or free-verse, which is just not true. Facts belong to no one and everyone and it is not quirky to criticize an opinion contrary to them. It is quirky to hold it. Any other examples? Please let us see them! Praise can be general, but harsh criticism that is not specific is reprehensible. Following the romaji transliteration and literal translation above, Gill offers the following versions with commentary. Author: Wait a cotton-pickin’ minute, Mr. Reviewer! You forgot to mention that the original Japanese for every haiku is also given. That is where I resemble Blyth, except that I offer more at a cheaper price, despite not having the backing of a Japanese bank! Note also the multiple translations that, in my book are attractive poly-faceted composites, stringing down the page of the review like the poop from a goldfish so that even I, their translator, feel depressed to see them, especially when grumpy forgets to tell the reader how they are arranged in the book. I tried to restore them below, and hope the pattern will hold in html. This excerpt, rather lengthy for the discussion of one haiku, is fairly characteristic of the author’s proceedings throughout this book. The reader gathers immediately that Gill’s interests and studies are wide, for the introduction of a seventeen-syllable verse prompts Gill to digress upon a philological point, to shift from the factual observation of the presence of Chinese characters in the text to a further parenthesis upon Japanese calligraphy in general, to veer yet again to a personal anecdote regarding the author’s possession of the marvelous cursive of a Japanese scholar, to turn slightly farther away from the haiku yet in explaining why he first queried the scholar upon a Pound and Waley version of a Chinese text and to return, at last, to poor Shouha only to reflect that the haijin’s intent, after all, may only have been to praise the art of his friend Buson. I admire the author’s display of learning but his digressive mode -- worthy of Tristram Shandy -- is neither conducive to clarity nor instructive for the general reader who, not knowing, for example, whom Buson might be, is suddenly introduced to him without any forewarning. Gill’s reading is expansive and impressive at times, if one can tolerate his many stylistic idiosyncrasies --- his insistent digressions, his typographical whims, his delight in and indulgence of his eccentricities. I can recommend the book to the prospective reader -- with that one proviso in mind. Author: Readers who are at all familiar with haiku will know of Buson, one of the most famous three haiku poets. Those who do not will gain nothing from being told who he is, while those who do know will have to read something they already know. I am writing for specialists as well as people who do not know much about haiku. There are compromises favoring one side or another on every page of the book. Is it possible that the reviewer’s evident dislike of writing with personality prevented him from noticing that? But, I am honored by the mention of Tristam Shandy, a character and book I like far more than what I have seen of the critic’s poetry (impeccably neat). “Conducive of clarity”? I hope not! Who is trying to clarify the world? Not me! And the New Year in Japan – the random chapter was surely not chosen after reading the others!) is a hazy time of beginnings. I guess there are those of us enchanted by jungles and mazes and those of us who prefer the wide open spaces. I imagine the reviewer sitting in his study gazing out at the fog and, rather than enjoying the game of peek-a-boo with the woods, anxiously waiting for it to recede so he can see everything. (And, someone, please tell me what makes a digression insistent, and give me examples from my work!). I will grant one thing, the critic is consistent. He snidely mentions “typographical whims” without giving the reader any idea of the nature of the improvisation, i.e., the outer appearance of the book, just as he attacked one paragraph without giving readers any idea of the book’s content. Prospective readers would do better to search inside the book at Google or Amazon and judge for themselves! I am happy to have finally had a review by someone who knows close to nothing of the subjects about which I write. Even the poor opinion the reviewer holds of my style is useful input. It tells me that the book may be too slanted toward the knowing to be interesting to others. But, it is possible the critic is just the wrong person for the book. Like Annie Dillard's Tinker Creek which many love and many hate, my style may be the sort that strongly affects readers one way or another. I would like other opinions, for I do not yet have enough readers and reviewers to know.. And please try to be specific when you criticize, so I can gain something from it. Harsh criticism without the details simply makes me want to bite off your head. And, remember, you never know: I could be reviewing one of your books some day. I await a third review, a convincing review to cast the deciding vote. As Japanese say, yoroshiku onegaishimasu!